American national security journalist Jeremy Scahill and leftist British columnist Owen Jones announced recently that they would not share a platform with a Palestinian-Lebanese nun at the Stop The War Coalition’s November 30 UK conference. Neither Scahill nor Jones provided any reason for their harsh “indictment” of Mother Agnes Mariam, who has worked tirelessly for the past few years on reconciliation in war-torn Syria, where she has lived for two decades. The journalists – neither of whom have produced any notable body of work on Syria – appear to have followed the lead of a breed of Syria “activists” who have given us doozies like “Assad is about to fall,” “Assad has no support,” “the opposition is peaceful,” “the opposition is unarmed,” “this is a popular revolution,” “the revolution is not foreign-backed,” “there is no Al Qaeda in Syria,” “the dead are mostly civilians,” and other such gems. For some of these activists, anything short of Syrian President Bashar al-Assad’s departure is no solution of any kind. 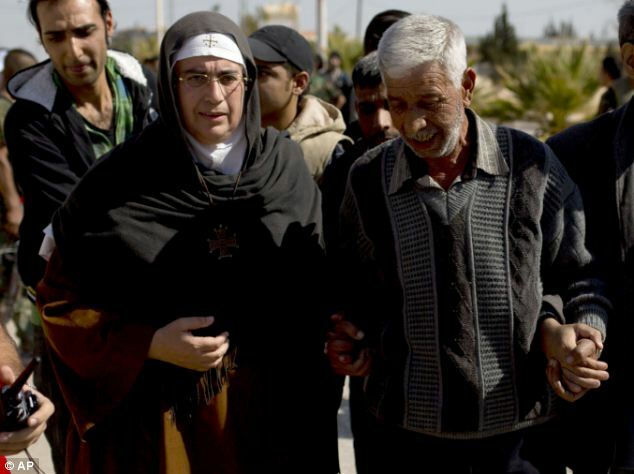 Mother Agnes Mariam, whose Mussalaha (Reconciliation) movement inside Syria works specifically on mediation, dialogue and the promotion of non-violence, is unmoved by black-and-white solutions: Reconciliation, after all, is a series of political settlements forged on both local and national levels. There are only compromises there, not absolute gain. She doesn’t actually care who leads Syria and who wins or loses, providing the choice comes from a Syrian majority. Yet the smear “Assad apologist” persists in following Mother Agnes on her visits to foreign capitals to gain support for Massalaha and its methods. It puts her at risk on the ground in Syria and inhibits her ability to open communications with those who would otherwise welcome the relief she brings. Both journalists are outspoken against the censorship of information by the “establishment media” so it is particularly galling to see them succumb to the bullying narratives that have so dominated Syria coverage in the mainstream. In their own domain and area of expertise they don’t trust establishment voices, so why trust them in any other arena? This rather obvious contradiction has turned the tables on Scahill/Jones – if anything, generating interest in Mother Agnes and what she has to say. Did the Stop The War Coalition ask you to withdraw from their anti-war conference or did you choose to do so of your own volition? I was invited to this conference, then I was informed about people that were against my coming and threatening to blow it up because of me. I preferred to immediately withdraw for the sake of this conference. Now, to tell you the truth I also have fear that this conference will not be useful, because these people attending are not applying non-violence principles. Non-violence principles means to be open to all adversaries. We can deal with people who don’t think like us. A non-violent approach is to dialogue precisely with people who are different. For a peace conference to begin like this, I felt like it is not a peace conference. Have you ever heard of Jeremy Scahill and Owen Jones before this? What do you think of the attempt to censor views on Syria – and does your own experience this week have any correlation with how the mainstream media has covered Syria for almost three years? You know, before working in reconciliation, I thought the so-called “democratic world” was really protecting freedom of expression and political choices. I am not involved with politics but they are ‘framing’ me; politicizing me. Am very shocked to learn that in this democratic world it is forbidden to think differently, talk differently and act differently from people who proclaim themselves as the ‘absolute reference’ for public opinion. This is a campaign of defamation. I am threatened by them: not by Jabhat al-Nusra, with whom I sometimes have good relations, or Al Qaeda – but by French media, by prominent leaders and CEOs of catholic NGOs, and by reporters. Am really astonished at how a reporter can become a prosecutor and a judge and can issue the sentence, and I am afraid that he can apply this sentence because today I see he works in total impunity. Some media outlets and activists have accused you of brokering a civilian evacuation in rebel-held Moadamiya, only to hand them over to the Syrian authorities. What actually happened? It was a purely humanitarian endeavor. Our (Mussalaha) team receives calls from all over Syria asking us to investigate people who have disappeared, to find out conditions for their release, to mediate on prisoner exchanges, to get food supplies to populations in need, how to transport humanitarian aid to hot areas, how to bring medical equipment to dangerous areas, how to arrange ceasefires, how to help violent opponents to shift to non-violence. We help to implement a non-violent spirit – we work with everybody, all sides, to do this. This particular evacuation was requested by the civilian population itself in Mouadamiya. We have Mussalaha team members from Mouadamiya who are mediators. We were addressing the humanitarian issue in Moadamiya for many months before this, to try to make reconciliation from a violent opposition to a non-violent opposition. And when I saw photos of starving children on the Facebook – like in Biafra – I went to the Syrian Minister of Social Affairs Kinda al-Chammat to say this was not acceptable and that we should do something. Then we made contact with all the world health groups and international NGOs – we had talks with them to provide food. A caravan of more than 20 trucks was ready to enter Moadamiya, but it was forbidden to enter. It is difficult to say by who – I think it was from the army that was besieging this rebel stronghold, but also from the warlords that fix enormous prices to provide the entrance of food. Minister Chammat was really open to finding a solution, I said if they are not giving us the green light, I will go myself to take the 18 children who were under threat of dying. So we were entrusted to negotiate with the notables and the families in Moadamiya. Our mediators (also from Moadamiya) were surprised when whole families expressed the wish to be evacuated – because they are the families of the rebels, and to ask to be evacuated means they will be relying on the government. When we heard this we thought it was an easier and safer solution because if you bring in food but the violence continues, those civilians will be harmed anyway. You know, under the Geneva Convention, it is illegal to transform a residential area into a battleground and if you do that you cannot keep civilians there like human shields. So the evacuation was motivated first by the desire of the families (not all, you know). The first project was to evacuate 100-200 women and children without any of their belongings, because there was a big fear that undisciplined members from either side would breach the ceasefire. It was delicate. Then on the very day, Minister Chammat, seeing hundreds of women and children arriving, told us “let as many who want to leave come out, because we cannot make discrimination,” so she made it open for that day. The government agreed to let us go alone; we were not escorted. All this was done in negotiations between the ministry and the governor of rural Damascus. Our responsibility was to bring the civilians to the barricade, but when we went there the rebels did not allow the women to proceed. I concluded, through contacts with the families that they were willing to come out, but we had to negotiate directly with the rebels. So I took a white flag into the area called no man’s land. I was followed by two of our mediators and by Sister Carmel – and it was heroic from her because she is a fearful person but she didn’t want me to go alone. There were tens of young rebel men, some armed, others not. And we were taken on a tour to see the destruction of the city and they asked us to come to the military council. (A video of Mother Agnes inside Moadamiya can be viewed here) They gave us security assurance. The commander arrived and they asked me to make a statement, which they recorded by video. But then we were detained, they wanted us to remain like ransom in exchange to let the women go out. We were hearing many noises and even gunfire while we were waiting. Then a real battle broke out – it was a big danger for everybody. We noticed that among them there was no unity, each would say their own thing. Finally, another leader came and agreed to the evacuation. Many of the leaders of fighters wanted their own families to leave. Others who don’t have families didn’t care. All we did was to answer a humanitarian request from rebel families. In total, we evacuated 6,600 women and children – we have all their names, they are all registered. More than 200 are not registered because they left immediately with relatives. Also 650 young men came on their own to surrender. The army considered them as fighters. A few were badly wounded and they were taken to hospital. The (media) criticism was based on fake stories because the opposition (not the ones in Moadamiyada) do not want to accept the success of reconciliation based on mediation between the government and rebels. And because – after the success of the Moadamiya evacuation – ten other points in Syria have asked for the same mediation. Yesterday, for example, we had another evacuation – from Beit Sahm I believe – who were evacuated temporarily until the violence ceases. These critics said many were killed, abducted, raped when they came out of Moadamiya. Yes, there have been some errors and undisciplined acts. For instance, nine of the women were robbed. Volunteers from the ‘popular committees’ robbed their gold. We have done this evacuation in three separate days. On the first day we had 20 boys that were arrested, but we launched a campaign about this and they have been released. There are only two young boys now who are detained. We are still following up to secure them. The rebels with whom we have negotiated have entrusted us with their families, and they are the families of leaders and fighters, not just normal families. Until today, the two boys who disappeared after the Moadamiya evacuations are a problem for me and my credibility with the rebels. I am struggling with the authorities to find these boys right now. The other major attack against you stems from a report you wrote about the aftermath of an alleged chemical weapons (CW) attack in Ghouta. You are accused of whitewashing the incident, blaming rebels for it and even charging children of “faking death.” How do you respond to these charges? I have been accused of denying CW attacks, of protecting the Syrian regime and of accusing the rebels of launching those attacks. I have never said this. In the foreward of a study I did on this, I affirm: I am not an expert. I am not talking on a military basis, or a forensic or medical basis. I just questioned some videos. It started because I was asked by the parents – survivors of a terrible massacre in the Latakia mountains – to help find some children abducted with women after the massacre. Some had recognized their children in the pictures of the chemical attacks. They delegated me to look into this for them. I was tracking those children in the videos – without this task I would not have had any incentive to look at the videos. My work at the monastery was in iconography and restoration (preservation) – I am very used to using my eyes to look for tiny details. I noticed discrepancies in the videos. I came to look at them for one thing (the abducted children) and in the process I discovered these videos were fake. When I went to Geneva to the commissioners in the Human Rights Council, I told them about my findings in relation to the missing children and the videos, and they said they would be interested to have something written. I do not incriminate anybody in this study. I do not pretend to decide if there was a CW attack or not. There were discrepancies and I am simply asking questions. The study was done in a hurry – we even said it was a beta version. Now I am finalizing the study that will introduce even more evidence. Those videos – numbers 1, 6, 11, 13 among the 13 videos claimed by the US intelligence community as authenticated and verified to be presented to Congress as genuine evidence of CW attacks – are fake, staged and pre-fabricated. Nobody thus far is answering my charges – they are incriminating me without answering. My goal in this is to find the children; that’s my only goal. If they were used for staging, are they alive? Where are they now? If they are alive they must be returned to their families. If they are dead, we want to see their bodies to bury them so their parents can mourn them and we want to know how they were put to death and where. I am asking to see the graves where 1,466 alleged corpses are buried in Ghouta and to take from the pit samples to conduct an honest inquiry. Because I doubt that there is such a pit. Normally, we are called by the rebel sides who invite us for some settlements. Usually Syrian fighters either want to shift to non-violence, surrender and continue their lives, or they want us to mediate an exchange between abductees and detainees. We mediate among the responsible parties in government, like the ministry of justice and ministry of social affairs – it depends, since each case has its own context. We do it on a neutral basis – we are mediators, not part of the conflict. We want to ease the fate of civilians and we consider the fate of the Syrian rebels. We do not care about foreign fighters. Those foreign fighters are legally not allowed to enter or be in Syria. But we have special care for the Syrian fighters. We consider them as victims. A 17 or 18-year-old boy who is to be jailed, his mother is crying, what am I to do? We talk via phone or Skype, sometimes we visit them as I did in many places. Sometimes the leader of a rebel group come to see me in a disguised way. Our (more detailed) talks are preferably face to face to build trust and transparency. Sometimes you have rebels who request the release of their people who have been captured, others want to surrender – they don’t want anymore to participate in the armed struggle. Sometimes the liberal factions ask for help against the radical factions. I always say that between Syrians there is not a real wall. There is not a watertight impervious wall, so we receive many requests. We have had meetings with Jabhat al Nusra (JaN). When they are Syrians they can be flexible, when they are radical (foreigners) they will not talk to you, they will kill you. It’s like the Baggara tribe of around 3 million – they have relatives in Liwa al-Tawhid and JaN too. Half the tribe are loyalists, half are opposition. And this is a hope for the future. Everybody can talk to everybody. Once in Raqqa they put me on the phone with the emir because they wanted dialysis equipment for their hospital and so we mediated and the ministry of health sent 3 dialysis machines for the sake of the civilian population. I am always astonished how my people in the reconciliation committee know everybody. Question from Twitter user @Kreasechan – What does she think should happen to those in command positions in the regime who have committed or commissioned war crimes and crimes against humanity? I will tell you something. All this ‘apparatus of incriminations’ is politicized. If you can read between the lines of the report of the international Commission of Inquiry, you will see that the Syrian government has a hierarchy so it is easy to incriminate the government as a whole. But the rebels don’t have a hierarchy – you have 2,000 different battalions. Every time you see violence by rebels, large scale ones with hundreds of civilians now killed every week on a sectarian basis… If you study the more than 100,000 dead in Syria, you will be surprised to see that more than 45% of them are from the army and security forces. Then you have 35% of civilians among those dead, more than half of whom are killed by opposition. Then you have 15-20% of dead who are rebels. So it is not true to say the government is the only one perpetrating things against human rights. The Commission of Inquiry will have to work without political pressure to implement a good inquiry where everyone will be heard, because we are scandalized that light is shed on one side, but not on the other side. I know by saying this, they will incriminate me. But in reality, I am on side of the victims – I care that they will be heard. If you don’t hear from every side, these victims will continue to be under violence with impunity. We must ask accountability from everybody. Those incriminated by a fair, unbiased inquiry will have to pay their crimes, even those who have instigated and financed sectarian crimes. Question from Twitter user @Paciffreepress – Do you love Assad, Mother Agnes? I live in Syria and I have a burden on my shoulders for Syria. I believe beheading Syria from its government is a dangerous aggression when the UN still continues to consider the government of Assad to be the legal government. I rely on the UN position, which is the legal position. I consider that the dismantling of any State is a crime against humanity because it deprives the citizens of their citizenship and from their legality. They becomes pariahs. The Syrian people should decide through fair elections. Question from Twitter user @r3sho – What is her opinion about Kurdish autonomy in Syria? I am with the Syrian people – they will choose their own way, even if they want to make a federation or whatever. I am personally against the division of Syria, but federalism is up to the people. In my view, dividing a country is an aggression, but if the country decides to be a federation, it is a legal thing. They are free to do so. Question from Twitter user ‏@broodmywarcraft: what does she have to say to those who call her a stooge for Assad? I am a stooge only for peace, not for Assad. I am for peace through reconciliation. I am for dialogue and I am for discussing issues with everybody who wants to discuss peace. If any Syrian, on any side of this horrible conflict wishes to discus peace or work toward peace through reconciliation, I am ready to help. Question from Twitter user ‏@bangpound: Does she still think the children were faking it in Ghouta? They were not faking it. I never said that at all. I believe that they were either under anesthesia or that they were killed. But as the videos are fake, my terrible question is what were they doing with them? Question from Twitter user ‏@Nouraltabbaa: If she is trying to perform a Mussalaha why is she meeting with Ali Kayyali and other militias but not the opposition fighters? For some hard cases, I have to go beyond the civil administration to negotiate with the warlords. We go there officially as a reconciliation committee, accompanied by some Muslim clerics. I have to mediate with the opposition and the government and the popular committees. I have to mediate with everyone. Question from Twitter user ‏@HRIMark: What effect is the campaign of defamation and threats against her having on her and her work? It affects my life. I cannot go back to my monastery. I was saved by the Free Syrian Army (FSA). They informed me about orders to abduct and kill me by foreign parties. They helped me to go out from Qara and they protected our monastery and they have not, to this day, given me the green light to return. A lot of them were workers in our monastery. Question from Twitter user ‏‪@Net_News_Global‬: Ask her, if she thinks, that there was, besides murderous propaganda, a real CW attack. We have witnesses and ‘social sensors’ everywhere in Damascus. Until today we have received 88 claims of death in Moadamiya (from the August 21 attack). We are told they were not killed because of sarin, that they were killed because of heavy shelling from the army and from suffocation from heavy shelling. The deceased were together in a shelter and they suffocated from this. Moadamiya people told us this. One of the reasons that I would like to see the graves is because 1,466 deaths is a real “social tsunami” in the Syrian society where everybody knows everybody and everybody is related. In the case of East Ghouta, we did not even have one case show up. We did not know of one single person who is dead. You know, to have relatives claiming this – the brother, the friend – nobody did. We did not have the “echo” of the death of 1,466 people. We are asking for a neutral inquiry with the presence of witnesses from both sides, where they will open the pits, see the victims, they will take samples randomly – where they took it, how they took it, etc. Samples should be sent to 5 labs under the same conditions and precautions. Until then there is a question mark on everything. I cannot say yes, I cannot say no. Question from Twitter user ‏‪@tob_la‬: How would she describe her relationship with Syrian intelligence services? There is no relationship. This is despite the wild allegations of some people who believe that the heads of the Syrian intelligence meet with me, a simple nun, on a daily basis. Do you believe that these people would spare such time? I have no “relations” with such authorities. As mediators we have to deal with these people when necessary. And without my mediation task I don’t have anything to do with them. Question from Twitter user ‏‪@MortenHj‬: What does she view as the biggest problem facing the refugees, especially children, with the approaching winter. How can anyone support? This is a very big problem. We need warm clothes, blankets urgently. During my trip in the US – from California – they are sending me a container with a special kind of textile that is very warm. “Oakley” warm clothing. We can provide for the local diaspora or NGOs to come collect these things from anywhere in the world and send them in containers to Syria. We are trying to do a big push for winter now. We’re also getting some tents. I will be going back to the US where an NGO will be providing us with something that resembles tents, but is rectangular. We are planning to get thousands of these – one per family. You have whole neighborhoods that are destroyed. Instead of displacing residents outside their areas, I would like to return them to their home, even if it is destroyed, and put them on their land in a refurbished structure. Like this, slowly by slowly they can rebuild their homes. Question by Twitter user ‏@edwardedark: Could you please ask her why the Vatican has not been more outspoken on the plight of Christians in Syria? Now the Vatican is talking. Mgr. Mamberti is saying loudly and clearly that The Holy See cares about unity, sovereignty, and the place of the minorities so they will not be isolated, cornered, or forgotten. The Holy See is promoting reconciliation, dialogue and a peaceful settlement of the crisis. They are against the arming of any side. They want more creativity for peace and not creativity for war. What I found outstanding about the Monsignor’s recent comments is that he said the Syrian people should isolate the foreigners, distance themselves and denounce them. This is a very clear statement against foreign intervention. Then he opened the issue of humanitarian aid and the dialogue between religions – interfaith dialogue. This is not the task of experts, but the task of everybody, the believers. So there is a real change in language from the Vatican. The Holy See is no longer shy about Syria – and to tell you the truth, it is time. What is left for the Christians in Syria otherwise?